If you are a European or multinational company delivering assessments in Europe or an awarding body providing certification in Europe, then you likely have responsibilities as a Data Controller of assessment results and data under European law. The European Data Protection Directive imposes an obligation on European countries to create national laws about collecting and controlling personal data. The Directive defines the role of “Data Controller” as the organization responsible for personal data and imposes strong responsibilities on that organization to process data according to the rules in the Directive. An assessment sponsor must follow the laws of the country in which it is established, and in some cases may also need to follow the laws of other countries. To help assessment sponsors, we have written a white paper which explains your responsibilities as a Data Controller when assessing knowledge skills and abilities. If you are testing around the world, this is material you need to pay attention to. One concept the white paper explains is that if you sub-contract with other companies (“Data Processors”) to help deliver your assessments, then you as Data Controller are responsible for the actions of the Data Processors and their Sub-Processors under data protection law. Regulators are increasingly active in enforcing data protection rules, so failing in one’s responsibilities can have significant financial and reputational consequences. For example, a UK company was fined UK£250,000 in 2013 after a leakage of data as a result of a failure by a Data Processor. Other companies have faced significant fines or other regulatory action as a result of losing data, failing to obtain informed consent or other data protection failures. If you use a third party to help deliver assessments, you need to ensure it will help you meet data protection rules. The white paper describes how Questionmark OnDemand can help in this respect. As well as ensuring you follow the law and reduce the risk of regulatory action, there are benefits in being pro-active to follow your responsibilities as a Data Controller. You build confidence with your participants that the assessment is fair and that they can trust you as assessment sponsor, which increases take-up and in encourages an honest approach to taking assessments. You also increase data quality and data security, and you gain protection against inappropriate data leakage. The white paper is free to download [requires registration]. In classical test theory, a common item statistic is the item’s difficulty index, or “p value.” Given many psychometricians’ notoriously poor spelling, might this be due to thinking that “difficulty” starts with p? Actually, the p stands for the proportion of participants who got the item correct. For example, if 100 participants answered the item, and 72 of them answered the item correctly, then the p value is 0.72. The p value can take on any value between 0.00 and 1.00. Higher values denote easier items (more people answered the item correctly), and lower values denote harder items (fewer people answered the item correctly). Typically, test developers use this statistic as one indicator for detecting items that could be removed from delivery. They set thresholds for items that are too easy and too difficult, review them, and often remove them from the assessment. Why throw out the easy and difficult items? Because they are not doing as much work for you. When calculating the item-total correlation (or “discrimination”) for unweighted items, Crocker and Algina (Introduction to Classical and Modern Test Theory) note that discrimination is maximized when p is near 0.50 (about half of the participants get it right). Sometimes you may still need to use a very easy or very difficult item on your test form. You may have a blueprint that requires a certain number of items from a given topic, and all of the available items might happen to be very easy or very hard. I also see this scenario in cases with non-compensatory scoring of a topic. For example, a simple driving test might ask, “Is it safe to drink and drive?” The question is very easy and will likely have a high p value, but the test developer may include it so that if a participant gets the item wrong, they automatically fail the entire assessment. 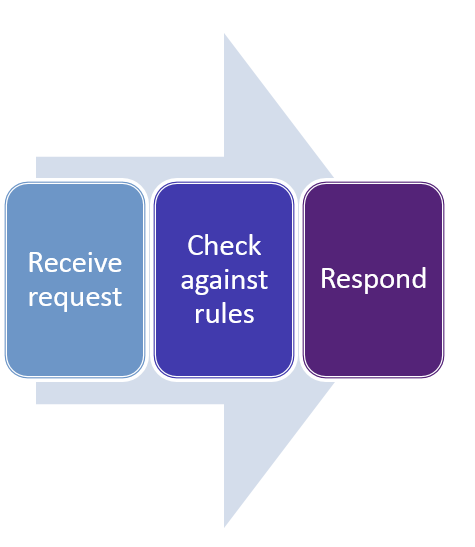 You may also want very easy or very hard items if you are using item response theory (IRT) to score an aptitude test, though it should be noted that item difficulty is modeled differently in an IRT framework. IRT yields standard errors of measurement that are conditional on the participant’s ability, so having hard and easy items can help produce better estimates of high- and low-performing participants’ abilities, respectively. This is different from the classical test theory where the standard error of measurement is the same for all observed scores on an assessment. While simple to calculate, the p value requires cautious interpretation. As Crocker and Algina note, the p value is a function of the number of participants who know the answer to the item plus the number of participants who were able to correctly guess the answer to the item. In an open response item, that latter group is likely very small (absent any cluing in the assessment form), but in a typical multiple choice item, a number of participants may answer correctly, based on their best educated guess. Recall also that p values are statistics—measures from a sample. Your interpretation of a p value should be informed by your knowledge of the sample. For example, if you have delivered an assessment, but only advanced students have been scheduled to take it, then the p value will be higher than it might be when delivered to a more representative sample. Since the p value is a statistic, we can calculate the standard error of that statistic to get a sense of how stable the statistic is. The standard error will decrease with larger sample sizes. 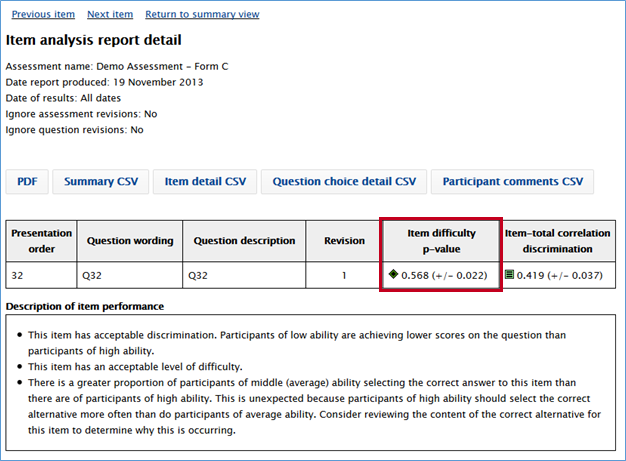 In the example below, 500 participants responded to this item, and 284 participants answered the item correctly, so the p value is 284/500 = 0.568. The standard error of the statistic is ± 0.022. If these 500 participants were to answer this item over and over again (and no additional learning took place), we would expect the p value for this item to fall in the range of 0.568 ± 0.022 about 68% of the time. In May of 2013 I attended the American Society of Training and Development (ASTD) conference in Dallas, TX. 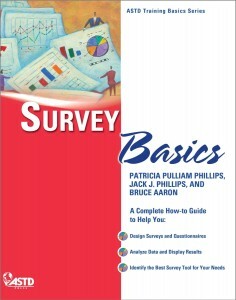 While there I took in Ken Phillips’ session called “Capturing Elusive Level 3 Data: The Secrets of Survey Design.” I also picked up the book “Survey Basics” by Patricia Pulliam Phillips, Jack J. Phillips, and Bruce Aaron. (Apparently there is some sort of cosmic connection between surveys and people named “Phillips”. Who knew?) Over the course of my next few blog posts, I’d like to discuss some of the things I’ve learned about surveys. In this series, I’m going to be looking at #1 and #4. The self-administered survey is what we typically think about when we hear the word “survey” – taking an evaluation survey at the end of a training experience. Was the room temperature comfortable? Did you enjoy the training experience? Many times you hear them referred to as “smile sheets” and they relate to level 1 of the Kirkpatrick model (reaction). Questionmark excels at creating these types of surveys, and our Questionmark Live browser-based authoring tool even has a dedicated “Course Evaluation” assessment template that comes with a library of standard questions from which to select, in addition to writing questions of your own. 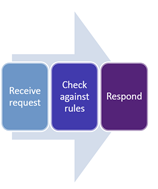 Surveys can also be used for Kirkpatrick level 3 evaluation – behavior. In other words, was the training applied back on the job? Many times level 3 data is derived from job statistics such as an increase in widgets produced per day or a decrease in the number of accidents reported per month. However, surveys can also be used to determine the impact of the training on job performance. Not only can the survey be taken by the learner, the survey can also take the form of an observational assessment filled out by someone else. Questionmark makes it easy to set up observational assessments – identify the observer and who they can observe, the observer logs in and specifies who he/she is observing, and the results are tied to the person being observed. To write a good survey, it is important to understand the objectives of the survey. Define your objectives up front and then use them to drive which questions are included. If a question doesn’t pertain to one of the objectives, throw it out. The best results come from a survey that is only as long as it needs to be. The next step is to define your target audience. The target audience of a level 1 survey is pretty obvious – it’s the people who took the training! However, level 3 surveys can be a bit trickier. Typically you would include those who participated in the training, but you may want to include others, as well. For example, if the training was around customer relations, you may want to survey some customers (internal and/or external). The learner’s peers and colleagues might be able to provide some valuable information as to how the learner is applying what was learned. The same is true about the learner’s management. In certain situations, it might also be appropriate to survey the learner’s direct reports. For example, if a manager takes leadership training, who better to survey than the people he or she is leading? The key thing is that the group being surveyed must have first-hand knowledge of the learner’s behavior. How disruptive or costly is the data collection process? Are you asking a lot of highly paid staff to take an hour of their time to fill out a survey? Will you have to shut down the production line or take customer representatives away from their phones to fill out the survey? 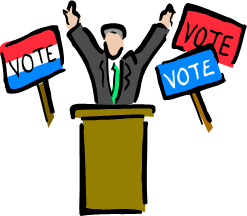 What are the stakeholders expecting? Whereas well-defined objectives define which questions are asked, the target audience defines how they are asked. Surveying the learner will typically involve more responses about feelings and impressions, especially in level 1 surveys. Surveying the learner’s colleagues, management, direct reports, and/or customers will involve questions more related to the learner’s observable behaviors. As this series progresses, we’ll look at writing survey questions in more depth. Here’s the one piece of advice I’d give above all others to anyone creating quizzes, tests or exams: Test above knowledge. You may be familiar with Bloom’s taxonomy of learning objectives, which is shown in the diagram below. At the lowest level is Knowledge; questions that test Knowledge ask for simple remembering of facts. At the highest level is Evaluation; questions that test Evaluation require participants to use judgement. 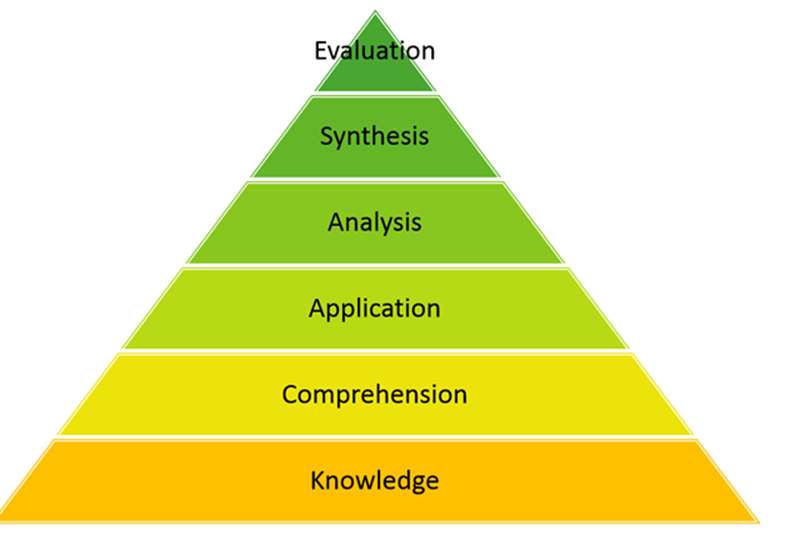 It’s great if you can write questions that assess at the highest levels of Bloom’s Taxonomy, but many organizations have a lot to gain by asking questions at any of the levels above Knowledge in the pyramid. Although there are times when testing facts can be useful, it’s usually better to test the application or comprehension of those facts. In today’s world, where facts are easily googleable, it is the use and understanding of those facts in the real world that is genuinely useful. By testing above knowledge, you are checking not just that the participant knows something but that they can apply it in some scenario. This is more valid and more realistic — and for most applications it is also more useful. This is purely a factual, knowledge question. If you are driving toward an intersection and the light turns from yellow to red, what should you do? This is a very simple example, but I hope it makes you realize that converting factual questions to scenarios is not very hard. I’d encourage you to consider using scenarios in your questions: Ask people to apply their knowledge, not just prove that they know some facts. Have your test-takers apply what they know to actual situations.